Give your entire team full visibility over the support conversations your Customer Success team is having with your prospects and customers. 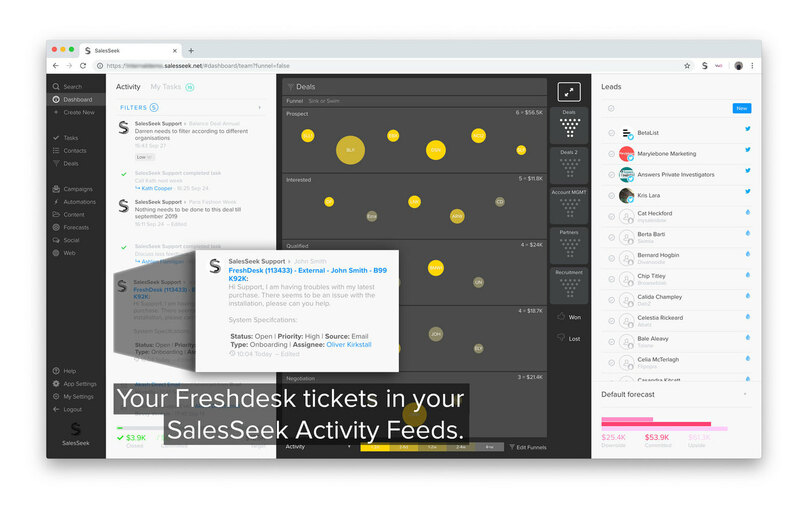 View your Freshdesk support tickets in associated SalesSeek Activity Feeds, giving context to customer relationships. Get better visibility over your entire business and keep your fingers on the pulse of Customer issues without ever having to leave your CRM. Step 2: Once SalesSeek Support has enabled the Freshdesk integration, log into your SalesSeek account as an Administrator. Step 3: Navigate to the App Settings screen. Step 4: Scroll to the 'Integrations' settings screen. Step 5: Locate the Freshdesk App and click the 'Connect' button on the right. Step 6: A prompt screen will appear requesting you log in to your Freshdesk account to complete the connection. Follow these instructions. Step 7: Now that your integration connection is complete you will start to see your Freshdesk support tickets populate in SalesSeek. This can take up to 24 hours depending on how many tickets you have. If you are unsure, please contact our support team.